The Olympic Games is perhaps the World’s largest watering hole, where different species from far and wide gather together for a common purpose and also have a few drinks. The latest gathering is in Rio and appropriately I am sitting in a street bar, downtown Barra, watching Brazil play Sth Africa with the local cariocas in their opening game for the Olympic tournament. After a few cervezas I feel the mood come over me, or perhaps its due to the strange smell wafting across the room. The bar happens to be called ganjha, can’t exactly remember why I chose this one but it is certainly making me feel part of the Brazilian way. The mood is very relaxed, surprising with the onslaught of the world’s media tearing the place and its people apart with predictions of worst games, bad water, muggings, zika, poor facilities. It becomes a matter of perspective. I was well advised and well prepared, travel with a fake wallet, take a second smart phone to hand over, carry your camera in a discreet shopping bag and don’t look like a tourist. Bit hard on the last one when I have neither the skin tone nor accent to make me anything else but. My pathetic attempts at basic Portuguese is a matter of mirth for the locals. The threat of impending danger, while always present, has been challenged. I have travelled by bus with the locals through favelas, walked through Copacabana at night and wandered lost through the back streets of Barra looking for my residence. The most threatening aspect to date have been the sidewalks. Paved with mosaic tiles, they are as stable and safe as the Brazilian economy. It is astounding that all the pavements are decorated with these small paving stones, I suppose the availability of cheap labor is close at hand. I have taken one tumble, and subsequently learned the art of walking while losing your step. The Brazilians are as impressed by the Olympics as the Australian Media, however their gripe is more personal. Government institutions including Schools, Universities, and elements of the Public Hospital system (admin and cleaning staff) have been closed for 5 months, allowing the Government to stop paying salaries and divert funds to the Olympics. The one element that local Rio residents are in agreement with is that the transport and road improvements have been significant. These of course are unavailable to most of the population until late September. 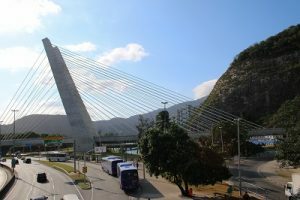 The new metro line connects the South Zone (Ipanema, Copa) with the West Zone (Barra) and will be useful except you can only travel between 11 am and 3 pm. 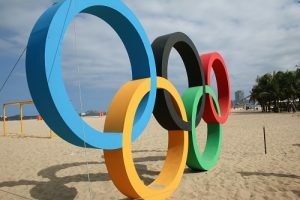 As it is now, Olympic visitors can only travel on the Metro with accreditation or an event ticket for that day’s travel. The good news is that when travelling to an Olympic event you should have a clear lane of traffic, an empty train and direct access to the venue, allow 2 hours to get there. There is a common theme in Rio, a little task takes a long time. I planned yesterday to collect my Cycling ticket from one of the major ticket outlets. One hour wait in the queue and then 45 minutes to upload the accreditation number I was provided to get a family and friend ticket. I did get my ticket and returned home late at night after navigating my way around the bus network. Faster and cheaper than a taxi and Uber is oversubscribed, seems every visitor wants to use Uber. The upside to Rio is that the weather is warm and often sunny, the people are friendly and the beer is cheap. Cheaper than a cup of coffee and I have taken to Bohemia, a local Pilsner that you can purchase at any outlet that sells water. In some places it is cheaper than water. The iconic tourist destinations are well worth the visit. 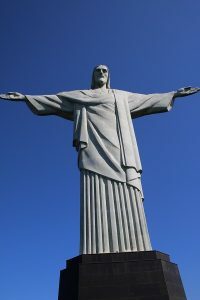 I ventured out to pay my respects to Christ the Redeemer or Corcovado, perched above the city looking down and no doubt asking why have you forsaken me. I mainly observed various media outlets getting their grabs and sound bite intros with the iconic imagery in the background. I also bumped into an Australian equestrian rider who is in the US team, competing in the three-day event. Boyd Martin was born and raised in Terry Hills, NSW, moved to the US possibly because he couldn’t crack it into the Australian team. His Mum represented the US in speed skating and his dad was a cross country skier, hooking up at the 1968 Olympics in Grenoble, allowing Boyd the opportunity to compete for both nations. Boyd’s previous horse was named Neville Bardos, although I am pretty sure he slightly modified it from the Neville Bartos we all know. Boyd was interviewed for ESPN and was stoked to be here competing for the US and it was a dream come true. Good luck to you Boyd, I will be watching. The opening ceremony is tomorrow night, Friday Rio time, and the only cyclist attending will be Anna Meares. She has more important matters to attend. The team I have been stalking, the Cycling Men’s Team Pursuit have been in the village for a few days, and have managed one practice session so far on the new velodrome. They are in good health and spirits after the training camp in Mexico and Flagstaff Arizona. I was fortunate to spend three days with them at Aguascalientes, Mexico, where they were fine tuning their preparations. 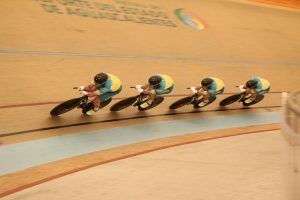 They have managed to ride exceptionally fast times, faster than the official world record, however at altitude this can be easily dismissed except the times they posted would have been comparable to breaking the record at Sea level. There is one thing you can be guaranteed, the Olympics will look spectacular with Rio as the backdrop. It is an event for television and you know you will get those closeups from Copacabana beach with the lame references. For me, the Global Watering Hole is about to open for business, I am scheduled to watch the Women’s Rugby, Fencing, Beach Volleyball and of course the Track Cycling, time to venture out and order more cerveza. You’ve taken us there DaveP. Thanks for giving us a real feel for the place. What’s the local booze like? Very drinkable, especially after a long day walking. The local rocket fuel is called Cachaça and mojito’s are available in the many beach bars, the scenery isn’t too shabby either. Thanks Dave. I can just see you in the Global Watering Hole, enjoying the local beer and the warm sunshine. I can also see you logging onto the Swans website occasionally, to keep up to date with our progress. Last week’s win helped! Been raining all week in Sydney, so let’s hope we get over Port – with ease! Enjoy your time there and take care! If you’re interested in topics for cycling documentaries, what about Melbourne in 1956 Olympics ? Held in suburban Broadmeadows, hardly a location you’d expect a road race. The drams including three unregistered Irish riders having to be removed from the staring line up, the Australian team falling at the start and having to deal with a hot Nor Wester, just some of the issues on the day. Any how keep up the good work, and enjoy Rio.